Brad Waters, 26, is a lean, lanky, energetic aficionado of extreme outdoor sports—rock climbing, backpacking, initiative games, and ropes elements. And he wants to use this love for recreation-as-ministry to reach Japanese youth for Christ. Waters, who was raised on a family farm two hours south of Pierre, South Dakota, is a 2007 psychology and biblical studies graduate of Grace University in Omaha, Nebraska. Always interested in extreme sports, he worked for a short while at an outdoors camp in Colorado and then connected with Northstar Outdoor Adventures in Japan, which was founded and is directed by Dan Junker, an alumnus of Grace College in Winona Lake, Ind. Junker, who was raised as a missionary kid in Japan, founded Northstar more than 20 years ago in Matsumoto, a town about 3.5 hours west of Tokyo. The nearby village of Norikura Highlands is known as the home of the northern Japanese Alps and is famous for its winter sports. It is in Nagano Prefecture, where the 1998 Winter Olympics were held. Northstar began as a ministry sponsoring “out trips,” focusing on snowboarding, backpacking expeditions, river hiking, rock climbing and, more recently, mountain biking. But several years after Junker founded the ministry, an unusual opportunity opened up to secure a property. According to Waters, a property only about five minutes from Junker’s house, which had previously been owned by an electric company, became available. The main building, situated on about an acre of land, could not be torn down because it was the home of an endangered species of bat. So Northstar acquired the property, developed it, and today the main lodge has guest rooms with a capacity of 48 people, and includes a lobby complete with climbing wall, dining room, office space, game room, and gear room. Additional developments include activities fields and an additional dormitory to house short-term staff. Northstar has three kinds of programs. The first is individual or family-style accommodations for Japanese who wish to come, stay at the lodge on weekends or holidays, and enjoy the nearby winter sports. The second is a group-style ministry, whereby a school, for example, may come for a ski trip or an outdoor education camp lasting 3-5 days. And finally, Northstar also sponsors its own camps, usually about three days in length, where children ranging from third grade through high school come for sponsored activities. Most young people attending these events are not Christian believers. 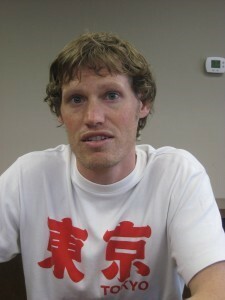 Waters’ interest in Japan began during his junior high years when a visiting Japanese student stayed at his house. After trips to Japan after his senior high school year and again in the fall of 2007, Waters is now ready to commit to full-time missionary service with Northstar and is affiliating with Grace Brethren International Missions. He describes Northstar’s ministry of friendship evangelism “extremely effective” and can give many examples of conversations with sports participants opening up for presentations of the gospel. Northstar also schedules events that attract many enthusiasts, who are primarily Shinto or Buddhist or a mix, in which they stage snowboard competitions, sponsor a dinner with a testimony and talk, and distribute Bibles to the participants, to locals who attend, and to staff members working at the ski resorts on the mountain. In Winona Lake the first week of May for interviews and acculturation, Waters anticipates soon beginning support-raising in the U.S. with hopes to return to Japan for language school in the fall of 2010. To follow Waters’ progress, log onto his blog at bouken.wordpress.com. The website for Northstar is www.ridenorthstar.com.